A Philadelphia contemporary arts hub, Bridgette Mayer Gallery exhibits museum-quality, often large-scale fine art in a minimalist Washington Square space. But for the next month, Mayer shows an expansive show of a wholly different nature. Opening today and on view through August 9, PhillyArtExperience: Benefiting BalletX is a huge group show of both established and up-and-coming artists held to support dynamic dance troupe BalletX, Philadelphia’s premier contemporary ballet company, which is also performing the evening-length work Beautiful Decay this week. In the current benefit show, more than 200 local, regional and international artists exhibit 400 paintings, photographs, collages and sculptures in the largest show of the gallery’s history. Each artist created one or two works on 10-inch square panels (donated by Ampersand Art Supply), and all works are priced at either $500 or $1000, with 20 percent or more of sales going to benefitting the ballet company. 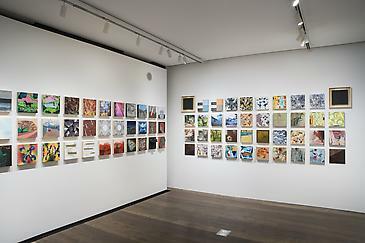 Installed as a grid on nearly every available wall of the gallery, the 10-by-10 panels hang side by side without drawing a distinction between price or notability. Works by recent MFA graduates sit right next to those by established artists held in prominent museum collections. Look for such works as a geometric acrylic by Alison Berry, a graphic abstract by Charles Burwell and a realistic orange frog by Rebecca Saylor Sack. Priced to sell, the small-scale pieces suit both novice art buyers — who might balk at the idea of investing thousands in a single work –and aficionados looking to expand a collection. Concurrently with the new summer exhibition, the gallery has launched a new site to aid artists, art lovers and art buyers, www.phillyartexperience.com. Check the site and sign up to learn more about the exhibition, to purchase works and — maybe the best part — to learn about opportunities to engage with the artists at three exclusive gallery events this week. On Thursday, July 11, be one of a select group to attend a walk-through at gallery and a private show preview. On Friday, July 12, register to attend the show’s opening reception and artist meet and greet at the gallery. Mingle with art lovers, collectors and the artists themselves. Finally, on Saturday, July 13, there’s the chance to take part in a brunch and informative panel discussion, Art Collecting 101, from noon to 2 p.m.
Join Bridgette Mayer and panelists Roberta Fallon, founder/editor of The Artblog; Ralph Citino, a CPA with Shechtman Marks Devor PC; Rebecca Rutstein, an artist and graphic designer; and Chris Schmidt, owner of Philadelphia’s Schmidt Dean Gallery. Interested? Uwishunu has your way in to this exclusive gallery event! Just let us know you would like to join in the brunch and panel discussion by dropping us a line. The first 10 art lovers to contact us will gain entry to Saturday’s brunch, each getting a single seat to the event. Don’t miss this moment take in, collect and support the arts in Philadelphia! When: July 9-August 9; Walk through, July 11; Opening reception, July 12, 6-8:30 p.m.; Brunch and panel, July 13, noon-2 p.m.